This multi media glass pendant is made from two pieces of fusing glass, epoxy resin and a colored sticker from a sticker sheet. It is fused using contour fusing temperatures so as to produce a handmade jewelry pendant with softly rounded edges to which the sticker is applied. The sticker used is cut from a sticker sheet and is not suitable for glass fusing. The multi media pendant is finally coated with clear resin to protect the sticker and give the pendant a high gloss finish which can't be seen in the photos. You will require the following items for this pendant. 2 pieces of glass, color of choice. About 1"x 11/4". Thin fire paper or kiln washed shelf. Mod Podge or similar sealant. ICE Resin or an epoxy coating resin. Step 1. Select sticker and measure, do not cut from sheet. Transfer measurement to the glass and cut two pieces slightly smaller. Step2. Using kiln washed shelf or thin fire paper stack the layers on the kiln shelf. Put shelf into fusing kiln. Step 3. Bring temperature up gradually to about 1400 F (760 C). If using thin fire paper keep kiln vented until the binders burn off and then close vent. Hold at around 1400 F temperature and watch for edges to soften and become rounded. You may need to adjust the kiln temperature to achieve the desired outcome. Do not over heat as the layers will fully fuse and spread out. Step 4. Switch kiln off, vent kiln and allow temperature to drop to about 1000 F (540 C). When kiln has cooled remove fused glass pendant from fusing kiln. Measure pendant again, it may have spread slightly. Cut sticker from sheet and trim to size. Step 5. Apply Mod Podge or similar sealant to sticker, make sure the image is completely covered, especially the edges, otherwise the resin may seep under the sticker. Step 6. After sealant has dried mix resin, don't forget to wear the proper safety equipment. Place pendant on a couple of layers of grease proof paper and apply resin with a wooden craft stick or other disposable item. Make sure your work area is fully protected. If a pouring resin is used it is preferable to apply it with a craft stick to prevent uneven coverage. Check pendant to ensure it is entirely covered. The resin will sometimes run and leave some gaps on curved surfaces. Any gaps should be carefully filled in. Try not to let a large lip develop around the bottom of the item as it will be difficult to remove. If any bubbles appear blow gently across the pendant to remove them. Step 7. After twenty four hours check the resin. If it is not soft to the touch you can begin to remove it from the paper. You will probably need to gently trim the edge with a craft knife. Do not let resin cure until it is very hard or you will have difficulty removing the pendant from the paper. Sand the back of the glass, apply a bail with two-part epoxy. 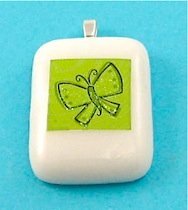 The techniques used in this multi media glass project can be used for fused glass pendants using non-fusible decals as seen in the multi media pendant project.